The Dutch might have been the first European side to make it through to the World Cup but Japan can go one better as they were the first team to qualify. 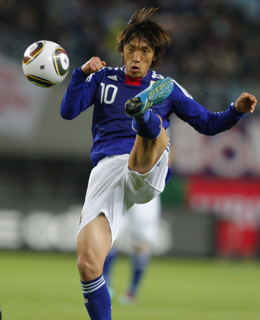 Samurai Blue can't do much worse than in 2006 (bottom of their group with one point) and will be hoping that canny coach Takeshi Okada marshals his troops  look to playmakers Shunsuke Nakamura and Keisuke Honda to offer inspiration  in a pretty tough group. Okado believes his side can reach the semi finals: Were that to happen, he'd probably be anointed as the next Emperor. Player to watch: The first Japanese player to score in the Champions League, Shunsuke Nakamura has punished some of Europe's top teams, particularly with his sumptuous free-kicks. See pictures of Japan then and now.